A roasted whole chicken is pretty ambitious and impressive in its own right. Still, it feels good sometimes to take on a project that's even more challenging. A deboned whole chicken can be cooked as a rolled-up, easily sliced roast. Whether stuffed or simply seasoned with fresh herbs, it makes for a nice presentation. 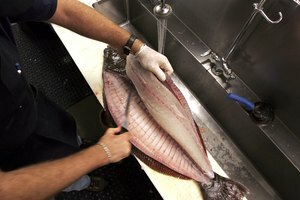 The technique isn't especially difficult, but it does require some patience and a very sharp knife. 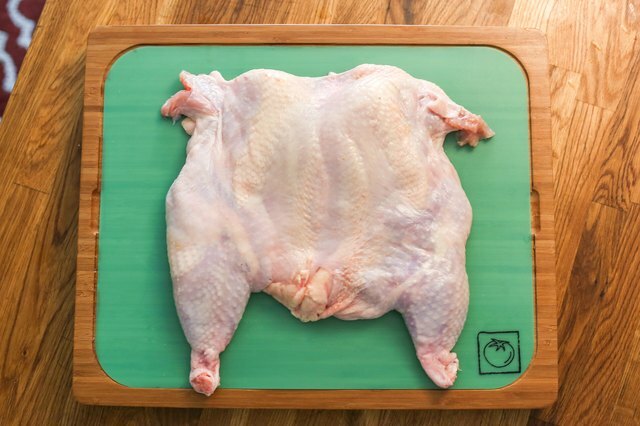 Place the chicken on a cutting board, with its backbone facing upwards. Run the tip of a sharp, thin-bladed boning knife down the backbone, slicing from neck to tail. 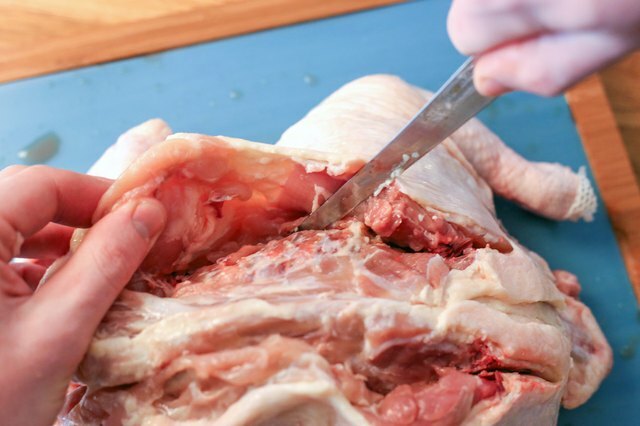 Pull back the skin alongside the chicken's neck, and feel with the knife tip for the wing's "shoulder" joint. Cut through that joint, then draw the knife along the ribs to the leg, freeing a flap of skin and thin meat from the ribs. Find the thigh joint with the knife tip, and cut through that as well. Repeat on the other side of the bird's backbone. It might feel easiest to rotate the chicken so that you're always cutting in a comfortable direction. When finished, the chicken's legs and wings should dangle freely from its body, with the ribs mostly bared. Follow the line of the ribs with the tip of the knife, making long strokes, until you reach the breast bone. Turn the knife to follow the bone, freeing the breast meat from the skeleton. As you reach the area where the bone is closest to the skin, cut carefully; otherwise, you'll pierce the skin and spoil the bird's appearance. Rotate the bird 180 degrees, and repeat the same set of cuts on the other side. At this point, only a small layer of membrane should be holding the skin to the breastbone. Sever this carefully with the knife blade, freeing the chicken from the main portion of the skeleton. Locate the hip joint at the exposed end of one thigh, and cut around it with the tip of the knife to free the knob of bone and cartilage. Run the knife down the line of the thigh bone, where it's close to the surface; then slice along the bone to free the thigh meat from it on all sides. Sever the knee joint and cut around the other end of the thigh bone, and pull the bone out. Repeat with the other thigh. 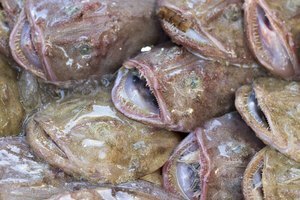 Cut around the other half of the knee joint, where the drumstick bone begins, and cut the flesh away from that bone as well. The skin at the drumstick's "ankle" end contains tough strands of gristle, so just cut that away along with the bone. Do the same for the opposite drumstick; then move to the front of the bird and cut away the wing's flat joint and pointed wingtip. This leaves just the meaty drumette in place. Cut around the end joint and trim the meat away from the bone, as you did the leg bones. Voila: the chicken is completely deboned. If you wish, you can leave the drumsticks and wings attached for a semi-deboned chicken that resembles a normal bird once it's stuffed. 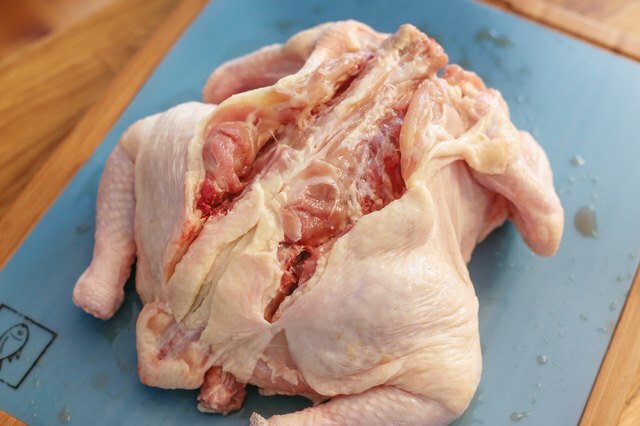 The first few times you attempt deboning a chicken, you'll leave a lot of meat on the bones. That's fine; the flesh adds flavor if you use the bones to make soup or chicken broth. 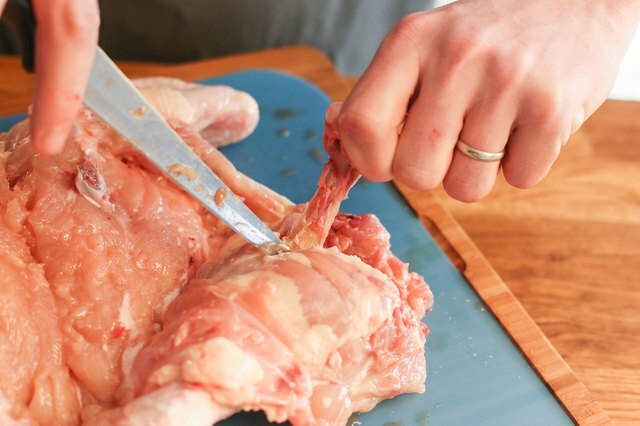 With practice, you'll become more adept at cutting the chicken cleanly away from the bones. To hold the knife properly, grasp the blade with your thumb and forefinger just past the point where the blade and handle meet. Wrap your remaining fingers around the handle to stabilize it. This grip gives you better control over the knife than if you hold it purely by the handle. When feeling your way along the bones with the knife's tip, try extending your forefinger down the knife's back. You'll feel the resistance as the knife contacts the bone, essentially turning the knife blade into an extension of your fingertip. This gives you a more delicate touch with the knife, and it helps you cut the flesh from the bones more efficiently. 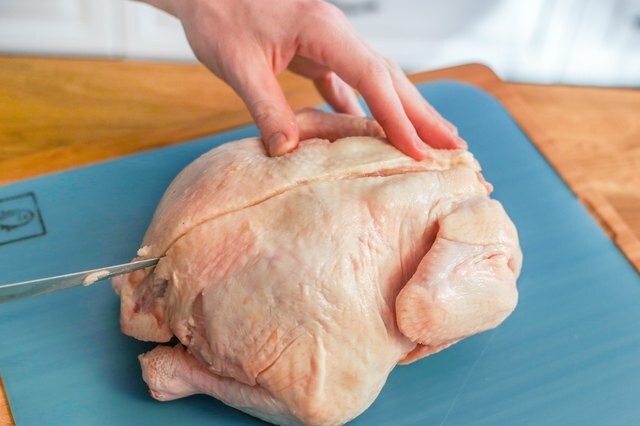 Some cooks prefer to wear disposable gloves when handling chicken to keep their hands clean; others find that gloves make them less dexterous in handling a knife. Try it both ways and see which you prefer. If you opt for bare hands, remember to wash them thoroughly both before and after handling the chicken. 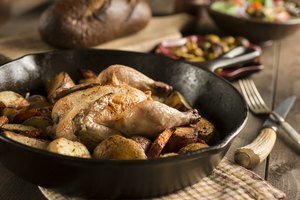 If you stuff the chicken, the stuffing must reach a food-safe temperature of 165 degrees Fahrenheit to counter the risk of pathogens contained in the bird. Avoid cross contamination by scrubbing your knife, work surfaces and hands thoroughly before and immediately after handling raw chicken.